Edited by: Rainer Voigt. With a preface by: Rainer Voigt. 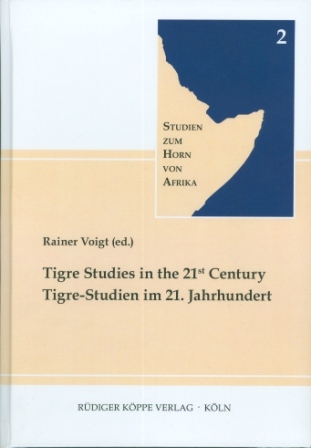 With contributions by: Maria Bulakh, Bogdan Burtea, Hatem Elliesie, Nicole Hirt, Mohammed-Ali Ibrahim, Saleh Mahmud Idris, Paolo Marrassini †, Abdulkader Saleh Mohammad, Stefan Sienell, Roswitha Stiegner, Tesfay Tewolde, Rainer Voigt, Andrzej Zaborski †. Series edited by: Rainer Voigt, Hatem Elliesie. 12 pp. Roman, 243 pp. You will find another review under PDF documents. The first volume of Akten der III. Enno-Littmann-Konferenz, 1.–4. April 2009, Berlin – Studies in Honour of Enno Littmann has been published as volume 4 of this series. As long as the printed copies are sold out and not going to be reprinted at the moment, you may download the complete text for free, using the link under PDF documents. The book is the outcome of the III International Enno Littmann Conference held in Berlin in April 2009. Of all the papers presented during this meeting the editor has chosen only papers devoted to the study of the language and culture of the Tigre people. The Tigre language ranks as the fifth most spoken in the Semitic family and its speakers amount for roughly 20% of the population of Eritrea. It therefore certainly deserves scholarly attention. The book is, to the best of my knowledge, only the second collection of essays devoted to Tigre studies (the first one being Lusini 2010). [...] Each article in the book is accompanied by a bibliography and in a very innovative decision also by a summary in Tigre as if to declare that the research on Tigre should be done also for and by the people themselves. Thanks to this approach, the book is not only a valuable scholarly contribution but also an important step in the construction of scientific terminology of the Tigre language.